Greetings Fellow PEO Etobicoke Members! 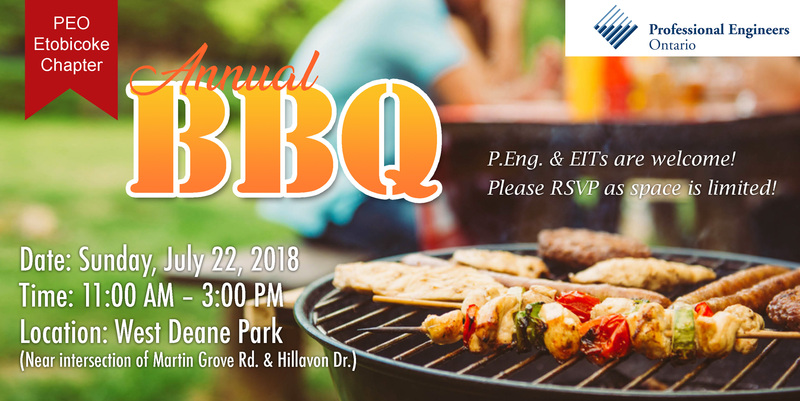 The Etobicoke Chapter would like to invite you and your family to its Annual BBQ in West Deane Park for some fun in the sun! There will be food and drinks provided as well as activities for the kids! Aside from enjoying the beautiful day, this is a great opportunity to network with fellow PEng/EITs, learn more about our chapter from the executives, and give your input for future events and what you’d like to see happen in our Chapter. Spaces are limited to the first 100 registrants so be sure to register ASAP! Please register the correct number of guests you will be bringing in the quantity field. This is a free event for PEO Etobicoke Members, however, members of other Chapters are welcome to join.